Military identified the man who took hostage of Peñafrancia bus as Corporal Rene Prajele, 36, of 31st Infantry Battalion. 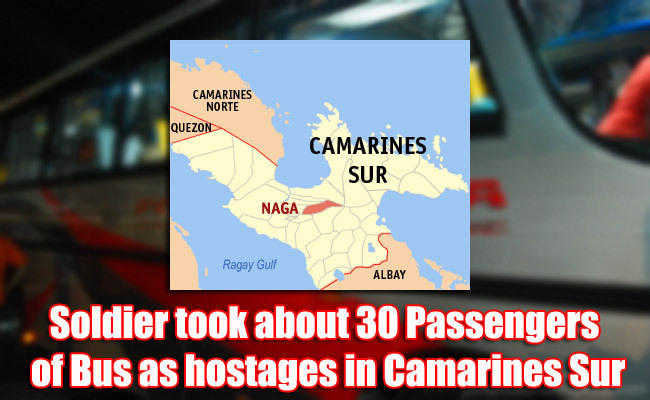 Prajele took about 30 passengers of the Peñafrancia bus as hostages in Barangay Comadaycaday, Camarines Sur on May 29. According to the reports, Prajele was riding the bus with his army issued M16 rifle. Most of the passengers were students on their way to Manila for the start of this year’s classes. The bus was on its way to Manila from Naga City through Maharlika Highway. The bus line, Peñafrancia Tours and Travel, operates in Bicol region to Metro Manila and back. Police Senior Inspector Malu Calubaquib of Bicol Philippine National Police said that the hostage incident took place at around 12:30 pm. The military commanders had worked with crisis management team, as reported by Lieutenant Colonel Marlowe Patria of Armed Forces. The Crisis Management Team composed of Colonel Amador Tabuga of the 902nd Infantry Brigade, mayors of Ragay and Del Gallego of Camarines Sur, and commander Lieutenant Colonel Medel Aguilar of 49th Infantry Battalion. The afternoon incident had caused heavy traffic along Maharlika Highway as the police in Del Gallego, Camarines Sur blocked the road. The hostage taking crisis ended before 5pm. Prajele was assigned as security for some government development projects. It appeared in the reports that he was having problems in his family.